Donal O’Leary, PTF’s Procurement Working Group leader, and Oscar Cabello, a local PTF Advisor in Chile, visited ChileCompra headquarters on March 24th, in Santiago. 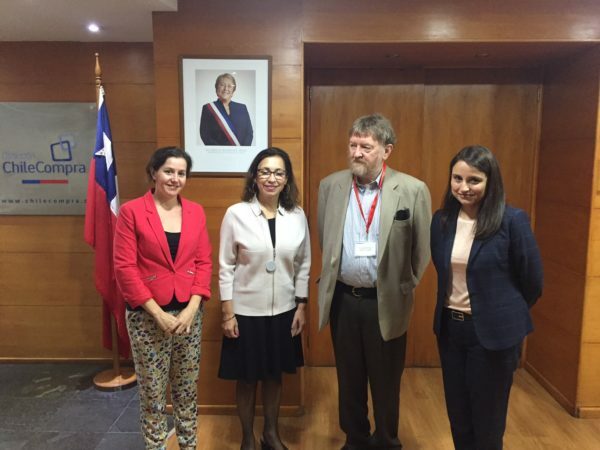 They had a fruitful meeting with Trinidad Inostroza, Elena Mora and Viviana Mora, respectively ChileCompra’s Directress, Civil Society Coordinator and Observatory Chief. ChileCompra is the national e-procurement platform, and PTF is exploring lessons learned from Chile on procurement monitoring by Civil Society Organizations, as a case study for the upcoming training of Civil Society Organizations in Ukraine.